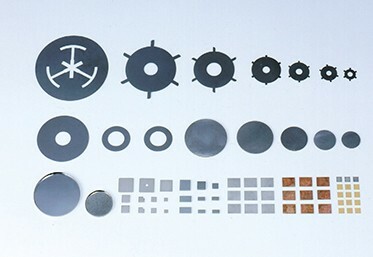 Toshiba Materials produces a range of molybdenum products using the wealth of powder sintering technology we have amassed during our years in business. Molybdenum has outstanding heat dissipation with a similar thermal expansion coefficient to silicon. Because of these properties, it is used as an IGBT (insulated gate bipolar transistor) material. Molybdenum is used in various X-ray blocking materials due to its property as an insulator against X-rays. Toshiba Materials produces collimators for medical X-ray devices. Molybdenum is well suited for glass melting electrodes as it has a high melting point (over 2600℃), extremely high electrical and thermal conductivity, low thermal expansion coefficient and lack of staining when melted with glass. 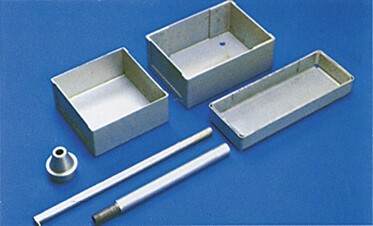 Toshiba Materials is able to produce large electrodes. 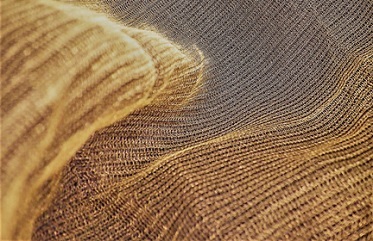 Molybdenum has a high melting point (over 2600℃), low vapor pressure and can be molded into a variety of sizes and shapes through powder molding and sintering, making it well suited for high-temperature furnace parts such as heaters, furnace boats, heating chambers, reflectors, protective tubes and nozzles. The antennas of man-made satellites consist of a mesh antenna folded up small, which is opened out wide in space. Satellites like this need to be made from a material that has a strong resistance to high temperatures, a low thermal expansion coefficient and high electrical conductivity, as well as being non-magnetic and strong. Molybdenum has all of these properties, making it well suited as a mesh antenna material for man-made satellites. Usually, it is difficult to draw a molybdenum cap at a greater depth than its diameter, as wrinkles occur. Toshiba Materials, however, has created a precise drawing method that does not cause wrinkles.